Food Intolerance discovery: Part 2 | RTB's Blog on Health & Fitness, Travel, Automotive, DIY, Dating & Relationships, Childcare & Education and much more! I’d carried out a food intolerance test (see part 1) and I was determined to try and avoid the foods flagged as me being intolerant to for the next 3 to 6 months. How hard could it be? The biggest kick for me was the cow’s milk. It’s in everything!! However, I’d already reduced my cows milk intake, after realising how horrific the cow milking industry is and my fiance had found a great substitute coconut based milk called Koko. Oddly, this consists mainly of water and grape juice, but has enough coconut in it to taste like a skimmed cows milk with a hint of coconut! The short answer is yes – I didn’t like it so much at first but quickly got used to it. I did look at other options; I wanted to avoid soya milk as soya bean had been flagged up as a borderline intolerant food and my fiance’s test had flagged it a definite no no for her – plus I hated the taste! Rice milk was an option for me but not her; but I didn’t like the flavour either. We visited a local health store and checked out their vegan cheeses. Most are made with soya, so no good – but we found a coconut milk based one that’s pretty damn good! It doesn’t melt so well, but we can live with it for a few months. We also found some gorgeous coconut milk based yogurts; the downside with those is that there were bloody expensive! Eggs though – how the hell to replace those? Well, in baking, you can – by creating ‘chia eggs’. You take a tablespoon of chia seeds, grind them a little to crack the shells, add 3 tablespoons of water, and put in the fridge for 15 minutes. What comes out is a gloopy gel – which seems to work as a perfect egg replacement in baking! Well, in everything I’ve made so far anyway, including a gorgeous buckwheat flour (more on buckwheat later) based ginger cake. But you can’t exactly serve ‘chia egg’ ‘sunny side up’ or as an omelette. So I’m missing eggs from that side… but I will survive for a few months. Next to address was wheat. Not a problem really. 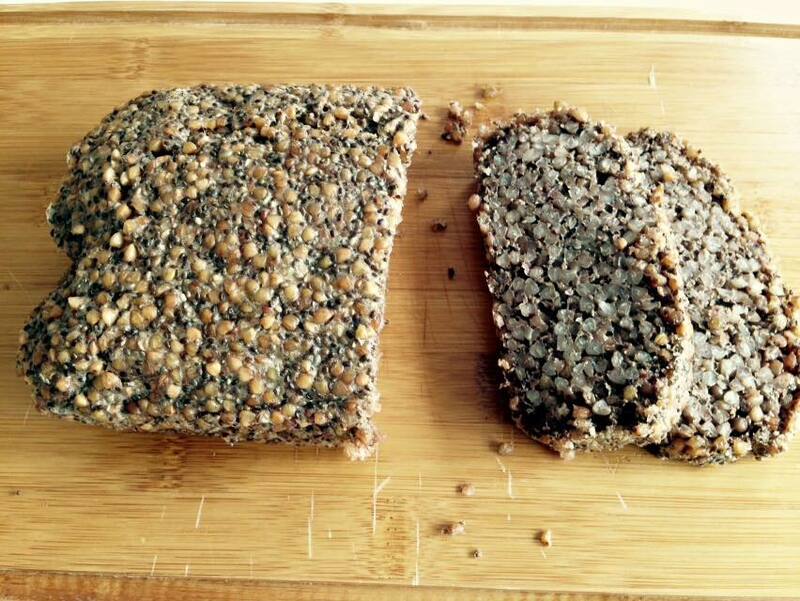 I don’t eat bread; see my other posts (life changing bread and keeping fit: the early days). I don’t eat breakfast cereals these days. Gluten isn’t an issue, and nor are oats, the main ingredient of our life changing bread, which isn’t really a bread in the old fashioned sense and contains no wheat. Except… flour. Most flour is wheat based. That means no croissants or pastries. Now that i sa little distressing! However, these types of ‘naughty’ foods are only an occasional treat anyway, and I figured I could avoid them for three months or so. Peas and beans I could cope without, and I’ve never been so bothered about raspberries. The three nuts flagged though were a disappointment – the ‘red’ entries, cashews and almonds, were major ingredients in my daily ‘life changing bread’. However, peanuts – the nut that most people have an issue with – was in my ‘green’ list. So, I’ve substituted cashews and almonds in my recipe for red skinned peanuts – and fortunately it works well. The most serious blow to my happiness though was the indicated intolerance to brewer’s yeast. Beer and cider contain a lot of this. Definite no nos. However, to my horror, I discovered that it’s also used in red wine (as well as white and rose). At this stage I seriously thought ‘sod this‘ and just stick to my usual diet. How could I live without red wine? Actually, it being late spring at this point, I was drinking less red wine and more refreshing, cooling drinks. Surely I could replace red wine through the summer with some refreshing cocktails? A new cocktail shaker and a re-stocked liquor cupboard has indeed confirmed that. Actually, it’s debatable whether drinking wine would be an issue with a ‘mild’ brewers yeast intolerance. If I had an actual allergy, even the smallest amount could be an issue, but that’s not the case. The amount of yeast left in a commercial bottle wine will be minute; home brewed wine might be a different matter though. And some lager is potentially okay due to the filtering process – some lagers are triple filtered. 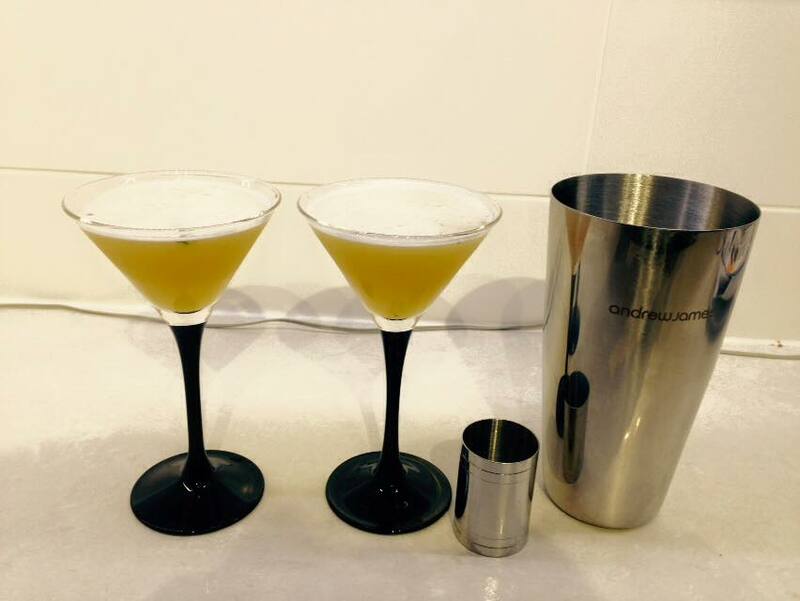 However, my new found cocktail making skills were keeping me and the fiance happily satiated for the time being. She decided not to start her diet yet, due to the sheer volume of foods flagged as high intolerance – it will be much harder for her; as a vegetarian she’s also limited. Without being able to eat soya, beans and eggs either and ensuring she gets sufficient protein could be an issue. Chickpeas are a good source, but although they weren’t flagged as an intolerance on either of our tests, we do often feel bloated after having them – and we can’t live on just chickpeas! However, I was able to cope reasonably well, and was keen to try the experiment. I’d got by the milk issue, but I was missing eggs – especially my staple omelette when I worked from home two days a week and at weekends. What could I eat to fill me up? I’d mistakenly confused wheat and durum wheat at this stage – so I thought I couldn’t eat pasta or noodles (it turns out I can, as long as they’re not egg noodles). However, a visit to the local health shop found both buckwheat pasta and buckwheat noodles! The former are ok; a tad bland and almost chewy for my liking. The noodles however, I found excellent – buckwheat has a slightly nutty flavour; with some green pesto mixed in they were gorgeous! Unfortunately, they are significantly more expensive than normal noodles though. I figured I could make a few things myself, using buckwheat flour (also from the health shop) as a substitute for wheat flour. It’s naturally gluten free, so my fiance could also enjoy it. Buckwheat isn’t a wheat anyway – it’s from the beetroot family! the ‘chia eggs’, and made it a little healthier by replacing half the sugar with stevia, agave syrup and honey for golden syrup, and coconut oil in place of butter. 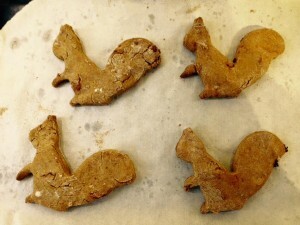 My first batch wasn’t bad – a little dry and crumbly. My second was much better; and I will attempt to make a third soon now I’ve discovered a few things about the way the ingredients work together. 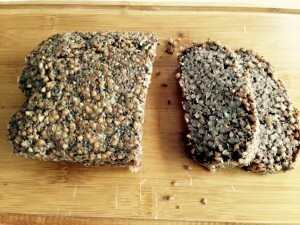 As my fiance could no longer enjoy our ‘life changing bread’ – not just because of the gluten in the oat (you can get gluten free oats) but also because of the linseeds and sunflower seeds which were also flagged on her intolerance test – I decided to try and make some ‘normal’ bread but replacing flour with buckwheat. Most of the recipes I found combined buckwheat flour with rice flour (no good for the fiance) or other gluten containing flours, or flours I’d never heard of, yet alone knew where to source. But then I found a good one that looked adaptable that used buckwheat groats. I didn’t have these, just the flour, so I had to make some estimates on ingredients proportions. It didn’t work out so well – I ended up with a very heavy and dense loaf. as per the recipe; it came out much better but to be honest I didn’t enjoy it. The buckwheat groats tasted ‘greasy’ somehow to me. I then recalled eating buckwheat in ‘groat’ form previously and not being a huge fan. Yet as a flour it had worked well in the ginger biscuits – where else could I try it? My most successful creation was buckwheat tortilla wraps. These are beautiful! They’re thicker than normal tortillas as the chia egg doesn’t ‘flatten’ so much like eggs do, but they taste great. We also made some pizzas (with coconut milk based cheese). We went for thin, crispy bases. My fiance loved the crispiness but I found it a little too crispy and prefer a chewier dough – still, my daughter enjoyed the mess of making the dough and it was quite a satisfying meal! My work colleagues had noticed me eating ‘life changing bread’ as well as my fibre drink (see A dieting aid that works) and we spoke about my experiments. He was eating some Jamaican ginger cake. My urge to eat some was overwhelming… I resisted, and instead the infamous words of Barney Stinson (of How I Met Your Mother) echoed though my head: “Challenge accepted“! The next day I made buckwheat flour based gingerbread cake! I found three normal gingerbread cake recipes and combined them. Working out the ‘wet’ ingredients and how much sweetness I needed was the tricky bit. I was replacing eggs with the chai eggs; that was fine. One of the recipes was a little healthier and used applesauce in place of so much sugar or molasses (black treacle). Another used golden syrup. I had no treacle or golden syrup, so I opted for a little brown sugar, half the white sugar of those recipes and a dash of stevia to sweeten, apple sauce, honey and agave syrup. Actually it was almost too sweet and too sticky – if such a thing could be said of gingerbread cake! My fiance absolutely loved it (and has requested I make some this weekend for her to take to friends in Poland she’s visiting) and my work colleague decided it was better than the store bought one – success! But it still wasn’t exactly healthy; I think I could half the sugar (and up the stevia a little) and agave syrup content and it would still be moist and sweet enough, and be a bit more healthy. 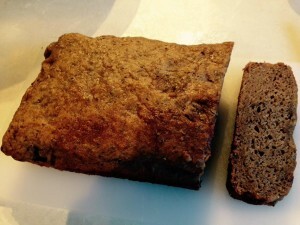 Even with lots of sugar though it’s still far healthier than a traditional gingerbread cake – one of the nice things about buckwheat flour is that it’s a low GI food – that is, it has a low glycemic index. According to some theories (see my blog, Montignac diet: I don’t do diets! ), consuming foods with a high GI (such as normal wheat flour) with sugar/fat is far worse for weight gain then combining sugar/fat with low GI carbohydrates. Buckwheat flour also benefits from having a relatively high protein content too. Win win! Buckwheat flour isn’t the answer to everything though – despite it being incredibly useful. It doesn’t work so well on it’s own in bread, as I’d found. I did some research and found that you need to combine different gluten free flours when baking, as they all have different properties, and you need to somehow replace the effects that gluten would normally create. Buckwheat is quite heavy and nutty too – Sorghum flour is apparently closer to wheat flour, and produces much lighter and fluffier results. It doesn’t have quite as much protein as buckwheat though, and is apparently harder to digest. Neither have any starch – something that is required to bond ingredients and help with raising of breads. The usual solutions are to mix in some corn flour or potato starch – but both of these are on our ‘to avoid’ lists. It looks like Tapioca flour (Tapioca starch is the same thing) might be a good solution. Buckwheat flour also isn’t great as a thickening agent – I made a buckwheat flour bechamel sauce (with Koko coconut based milk of course) last week for a cauliflower and broccoli bake. It tasted great but took ages to thicken. Apparently arrowroot flour is a good thickener. Another trip to our local health store is in order! Before I’ve had chance to visit though, I fancied making a moussaka, and this time I combined buckwheat flour with some ground chickpeas – basically gram flour! That worked much better and thickened up nicely. Seven or eight weeks into the diet now… I will continue to experiment and will post a new blog with any interesting recipes (I want to try and make a gluten free baklava!) I find and will also post after the 3-6 months is up with the results.